The AUTONOM TALENT®-Team succeeded in making it under the best 6 with their project, under 152 submissions in the category “Personnel & Training”. We are therefore looking forward to an exciting award ceremony on June 9. 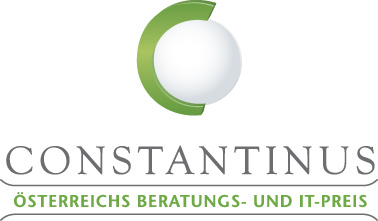 The Constantinus Award is Austria’s consulting and IT prize. The competition is taking place for the 14th time in 2016. For the Constantinus Award, Austria’s consulting and IT companies demonstrate their high quality performance by submitting projects in different categories. The winners will be determined on CONSTANTINUS DAY 2016. The trade association management consulting, accounting and IT (UBIT) will honor the best projects based on quality of the performances. The initial situation was that especially work in nursing care is very challenging and straining, physically as well as mentally and demands a lot of strength and energy. Main objective was therefore to maintain resources, the optimal development of potential, reinforcement of positive emotions and strenghtening of the regeneration and performence potential of executives and employees of Caritas Upper Austria. The project was implemented with help of the AUTONOM TALENT® 3-step-method “Measure. Develop. Ensure.” which measures the potential of the participants based on an individual 24-hour-heart rate variability- measurement. After analysis of the data a confidential personal feedback is given. Taylor made recommendations and exercises for the employees as well as interventions on the organisational level ensure the overall success. This was linked with an APP, supporting the control and integration in operational processes to ensure pleasure of achievement and well being of employees. We are very pleased about being nominated and are eagerly awaiting the award ceremony on June 9, in Linz!